Welcome to the Room of Requirement where you find exactly what you need right now to elevate your Tribal Fusion technique to the next level! Whatever form your dance boggart takes at this moment – strong and even shimmies, sharp isolations, smooth undulations, arm and leg coordination – we have the incantations and practices to bring it under control and help you laugh at it instead of fearing it! 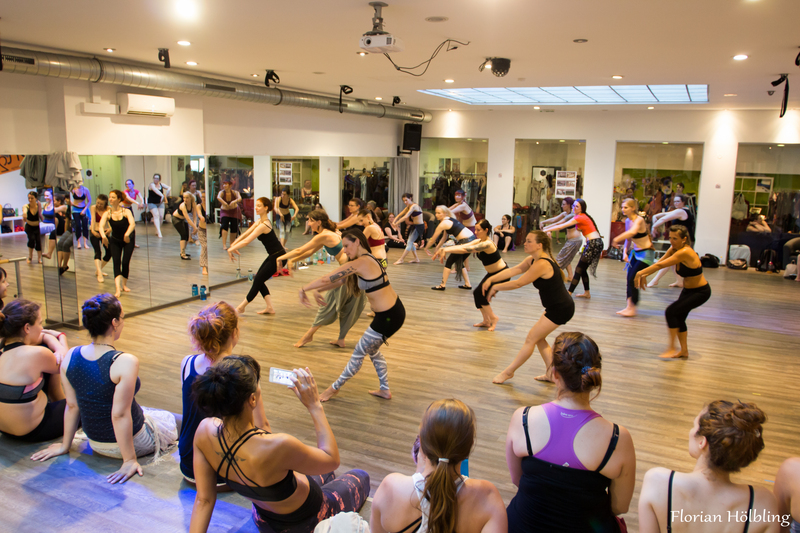 Energizing warm-up will be followed with movement variations and challenging layers to activate your brain-body connection and give you plenty of spicy material with deliciously brainmelting and outrageously fun technique drills. Playing finger cymbals while dancing helps to deepen your sense of the rhythm, understand music and movements more deeply, and it is also tons of fun! 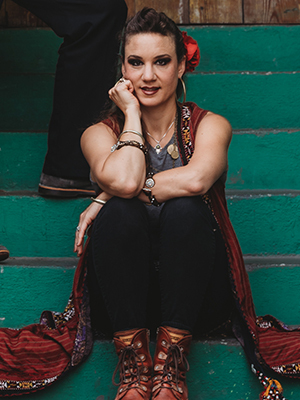 After a purposeful warm-up and drills you will learn Elizabeth’s signature combos including choice Egyptian steps, a bit of classic Jamila Salimpour influence, and a blending of folkloric feel and Tribal Fusion style. Twist your mind-body connection as we add finger cymbal patterns to soak the music in more deeply. Bring finger cymbals and a water bottle and get ready for the dance party! Manton is a beautiful and challenging prop that will surely bring a new dynamic to your dance! Agata will teach you a movement dialect with manton that is suitable for group improvisation, but can also be an inspiration for a choreography. We will go through the basic manton moves and review all the most important aspects of flamenco-inspired technique in ATS. We will also include some very new and fresh manton combinations created by Agata with her dance partner Katarzyna and the troupe The Siren Project. There will be something for returning participants as well as newcomers to this wonderful prop! Please bring a square shawl – size at least 115x115cm, doesn’t have to be a professional manton. Agata will also bring some shawls for sale! Drama fusion is not just a tool for the theatrically interested dancer. It contains many valuable techniques and processes you can use in your general dance practice to elevate your expression and stage presence, to make your dance more radiant and even help you get more relaxed when going on stage. In this workshop we will work with different drama drills and visualization techniques to initiate our creativity and also talk about how to merge the ‘theater’, the story and the feelings into our dance. Come dressed both for dance and play! No theatrical background is needed, just an open mind. 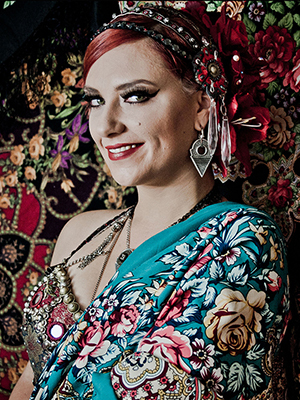 Datura Style is the dance format of Tribal Fusion pioneer Rachel Brice and includes various aspects for the personal as well as collaborative dance routine. One pillar of Datura Style is the group improvisation similar to American Tribal Style (ATS) based on a common vocabulary of various movements and combinations. In this workshop we get to know a selection of characteristic Datura Style combinations: from the individual movements, steps and arm patterns, to the transitions to the dynamic combo – from the individual words all the way to the first complete sentence of a common language. Join Elizabeth Strong, former Bellydance Superstar and Dan Cantrell, an Emmy Award winning musician, to get a deep dive into musicality. Learn how you can shape your dance, improvise more freely, and feel confident and comfortable dancing to live music. 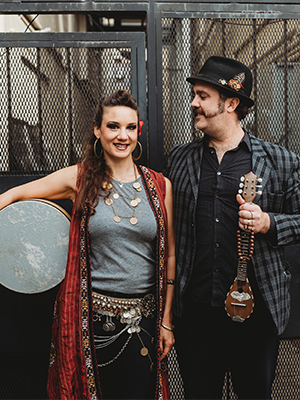 With their twenty years of professional experience teaching and performing all over the world, this generous and heartfelt artistic couple provide a safe and inviting space to nourish your love of music and dance. This is a live music class in two parts, with time for one on one practice dancing with the musician (voluntary). We will focus on transitions between sections and beginnings and endings of songs, as well as on improvised instrumental solos. If you’ve got some basics and you’re ready to develop your artistry, then this is the right intensive for you! “I don’t want to play it safe. People kept on telling me to slow down, you know. They would say, remember, less is more. I always said, how can that be? How can less be more? It’s impossible. More is more.” – Yngwie Malmsteen, guitarist. 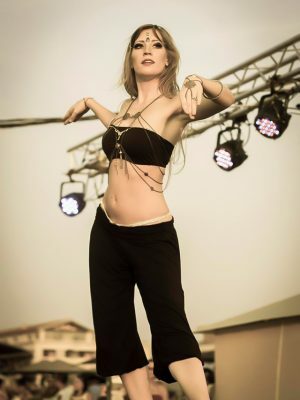 Inspired by the results of her cross-training for Tribal Fusion, Doro will lead you through a workshop that is designed to give you more strength and flexibility for your dancing. We’ll be using exercises from other disciplines like contemporary dance, pole dance and weightlifting she found especially useful to incorporate into her own practice. 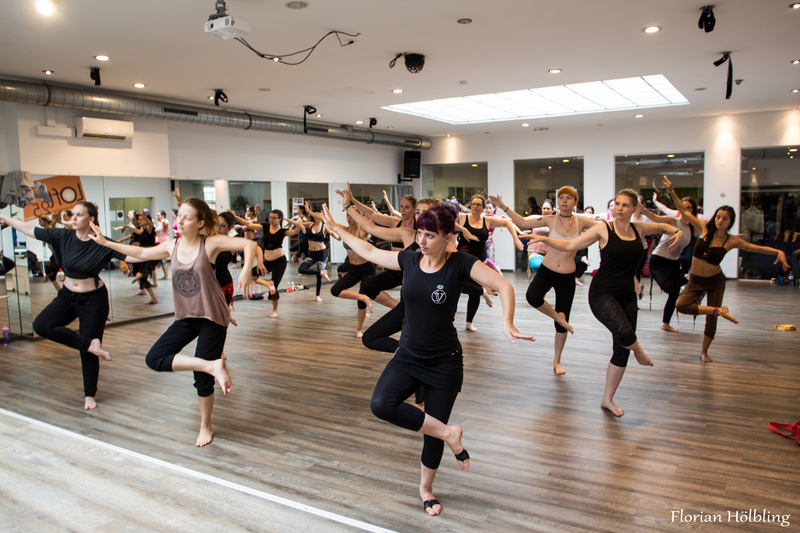 An extended warm-up session will target the areas we most need for a crisp Tribal Fusion technique, incorporating strength and flexibility training with variations for less or more intensity to give you some powerful tools for a stronger dance body! To implement the new information into Tribal Fusion movements we will dive into a flow of technique drills with focus on strong execution and clean isolations. Bring your water bottle, a towel and prepare to have fun! Bring your dance to the next level! Agata and Katarzyna have danced and taught together for many years. In this specially composed workshop they would like to share with you their favourite tips and exercises that will help you with the most important ATS skills. Our dance in a nutshell is: technique, communication and musicality. ATS dancers know the basics of dance well and are always open to learning more about the picky technique of basic steps. They are always in the here and now, in complete awareness of the group and the situation. Last but not least, they are also artists who interpret the music and are able to get into the flow. Come and experience how all these aspects come together to bring more joy and harmony to your dance! Enter an alternative reality where the time stretches endlessly before it contracts in a gasp, where movement fills the gaps inbetween breaths like a melted mercury, liquid and smooth and alive… Like two parts of a broken mirror, the jagged edges fitting together in a puzzle of reflection and contrast, we will create a sequence combining familiar with yet unknown. Familiar: The otherworldly quality of slow Tribal Fusion movements, explored and drilled to their fullest potential, then set into a partly choreographed sequence, leaving pockets of emptiness to be filled by the yet unknown: a journey of melting inwards using techniques from butoh, bringing back a feeling and a movement quality specific for each dancer, an impulse that dances the body. Katarzyna has been creating and developing flamenco inspired ATS movement dialect with flamenco fan since 2014. Together with Agata Zakrzewska she founded The Siren Project, a troupe dedicated to exploring flamenco inspirations in ATS. Fan is a very gentle and elegant prop, which emphasizes the arm movement in ATS. In this introduction workshop we will learn how use it with ATS slow basic steps and the most exciting turns like Sahra Turn, Barrel Turn, Wrap Around. We will focus on floreo technique and synchronization in groups, using movement combos to help drill the transitions between the steps. Please bring a fan 23-30 cm big, easy to open, made from wood or plastic.